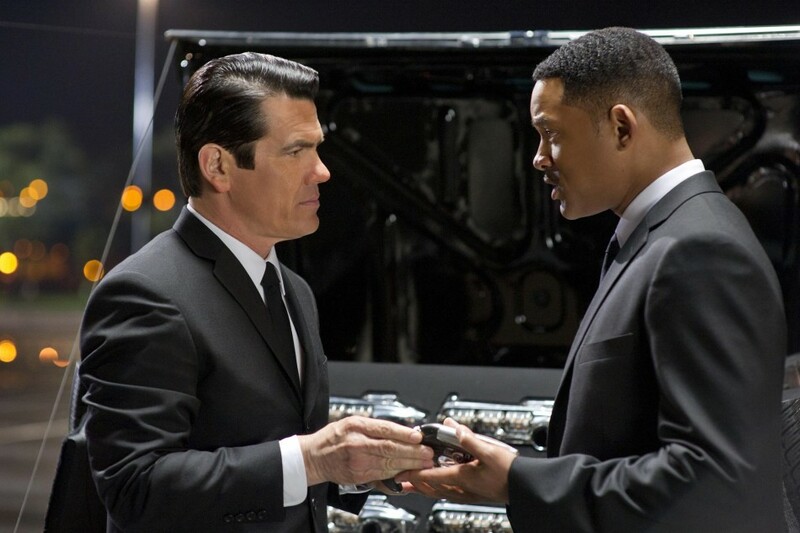 In this third entry of the Men in Black franchise, Agent J (Will Smith) must travel back in time, to not only stop an evil world conquering alien called Boris (Jemaine Clement), but also save the life of his partner Agent K (Tommy Lee Jones). While the first Men in Black movie is recognized as a touchstone of 90’s sci-fi cinema, it’s first sequel is a different story. “Men in Black 2” left fans with a sour taste in their mouths, because it was basically a rehash of the first film; minus any dignity or charm. 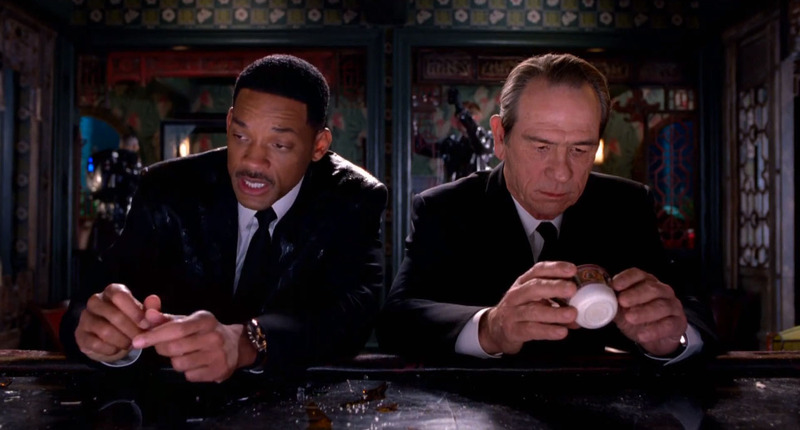 A Still from Men in Black 2, showcasing it’s classy appeal via sleazy fanservice, two Johnny Knoxvilles, and forced product placement. The Second film’s reputation is what pushed me away from giving Men in Black 3 a chance, but today I decided to finally give it a go on Netflix! So, the question is, is it as bad as it’s predecessor? Thankfully not, as it actually has a sense of bloody self respect! Instead of just simply cloning the formula from the first film, MIB 3 throws Time Travel into the mix, leading to a chance to meet younger K (played by Josh Brolin, nailing a spot on Tommy Lee Jones impression), and the opportunity to see the world of MIB in the late 60’s. The Movie’s take on sixities culture, while a tad cartoony, is certainly a charming aesthetic for the film. Background characters sport groovy fashions, MIB technology is wonderfully dated, and the aliens we meet resemble the extraterrestrials of 60’s Sci-fi cinema. I also respect the film for not shying away from satirising racial tension of this era, as it lends to some pretty poignant humour. It’s this time period setting that really helps the movie to be it’s own thing, and stand out from the trilogy. While K is played by Brolin this time, the dynamic shared between our lead agents still has that spark, as the Agents bounce off eachother pretty well; with J being given some good one liners and K serving as his usual dry surly self. There’s also a little pathos to their relationship in present time, thanks to a moving plotline about the emotional distance between the agents. Our villain, unlike the boring and nonthreatening Serleena from MIB 2, is a rather unsettling presence as well. He has a grotesque visceral alien design, and the film does a great job framing him as one hell of a dangerous menace worth fearing. I did also feel quite disturbed by the creepy dart shooting pet monster that lives in his hand. 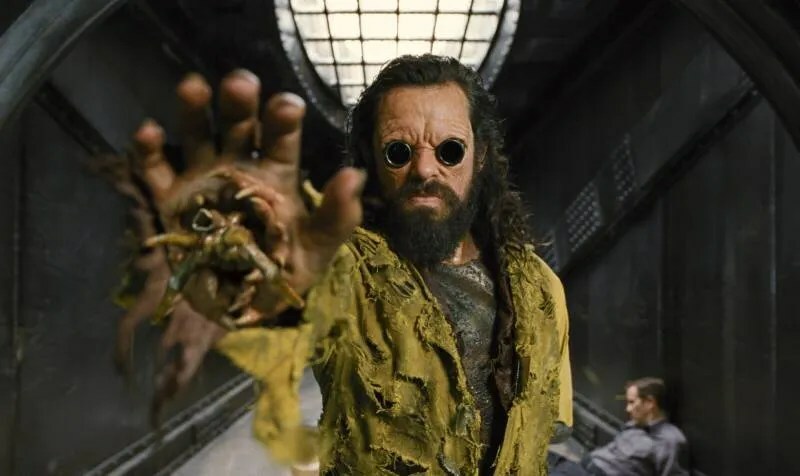 Jemaine Clement, who I swear is contracted to only play villains, manages to bring both humour and threat to the role of Boris too. He doesn’t get much screen time, as our heroes are busy trying to actually find him, but he is a riot whenever he is present. Jermaine Clement’s Boris escaping jail. Fans of Frank the pug and the Worms maybe disappointed though; as Frank is nowhere to be seen and the worms only have a quick cameo. However, as someone who could take or leave those characters, I wasn’t too bothered about this. Instead, we get a different comic relief supporting character, an eccentric time reading alien called Griff, who I honestly dearly loved SO much. Griff is adorably sweet! I really liked how he both genuinely cared about saving the human race (he lost his own planet, so he can sympathise), and also does his best to help out during the agent’s mission. The Writing for Griff could have gone in an annoying try hard direction, but he’s actually one of the most likable and competent sci-fi characters I’ve ever seen in a film. Griff, doing his best to convince the army to help our heroes. But while so many things about the film do work, you can still tell that it’s a sequel that was made 10 years too late. The Love and respect for the first film is there, but this is a very 2010’s take on the franchise, one that depends heavily on long bouts of comedic small talk to carry scenes. Sure, we do get some pretty big chuckles from the dialogue, but there are moments where the script starts to lose it’s steam a bit. It doesn’t help that the overall narrative is a tad thin, as we’re basically watching two MIB agents wandering around sixties New York, without much idea about what they’re supposed to be doing. The Novelty of seeing a younger K can only be interesting for so long, and we don’t get to see what made him become such a grump until the very end. Don’t get me wrong, this big twist adds so much emotional weight to the agent’s partnership, as it’s a REALLY huge moment, but I shouldn’t have to wait until the climax to feel like this sequel has a point to exist. More scenes could have been dedicated to developing our character’s place in this timeline, but the film is more focused on long winded comedic banter instead. To Conclude, Men in Black 3 is certainly a big improvement on the second film, with lots of laughs and fun special effects. Although, while it does chuck the theme of time travel into the franchise, it doesn’t really have much important value in the series, until it’s final minutes. There’s some entertainment to be had for sure, but it’s not exactly a film that you MUST see after seeing the first. I can suggest it as a better alternative to watching MIB 2, but be prepared to wait a while until the film starts feeling necessary. Funny story I think you might like: The first time my family and I watched this movie, we actually thought Boris was played by Tim Curry because he looked and sounded just like him. It wasn’t until we saw the credits that we realized it was Jemaine Clement. I loved MIB 3. I haven’t seen the second film. I especially am a huuuuuuge fan of Will Smith. He is my no.1 favourite actor of all time. He does well in every movie he’s in except Shark Tale and After Earth. I didn’t like his character of Oscar.